I LOVE lipstick. I wear it every single day and I never leave the house without it. A lot of women think that they "can't pull it off" but, oh contraire! Lipstick looks good on everyone! I usually wear a different shade each day and by the end of the week my purse is full of lipsticks like a crazy person. I have a lot of friends who work at corporate Sephora and I don't want to upset them by saying my favorite lipstick brand, but I'm pretty sure you can guess from the photos (this is only a small peak into my makeup bag. I love nars, stila, make up forever, and chanel). 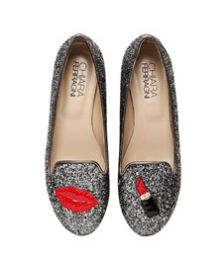 To show how much I love a perfect pout, I am thinking about getting these chiara ferragni shoes! I can't decide if I like the lace or the glitter pair better-- both are perfect for lipstick lovers, mac addicts, sephora specialists, and shoe lovers! my purse at the end of the week.